Providing you the best range of galvanized steel coils with effective & timely delivery. Galvanized Steel Coils have gone through a chemical process to keep them from corroding. The steel gets coated in layers of zinc because rust won't attack this protective metal. For countless outdoor, marine, or industrial applications, galvanized steel is an essential fabrication component. The principal method of making steel resist corrosion is by alloying it with another metal, zinc. When steel is submerged in melted zinc, the chemical reaction permanently bonds the zinc to the steel through galvanizing. Therefore, the zinc isn't exactly a sealer, like paint, because it doesn't just coat the steel; it actually permanently becomes a part of it. 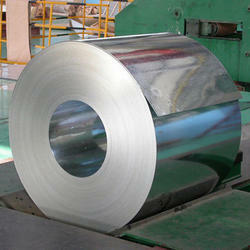 Looking for Galvanized Coils ?